29 Responses to Should I Buy the Apple 3G iPhone or Nokia N95? A tough decision to make. Though it seems that web browsing is the only real drawback of the N95 to you. I have a N82 which is very similar to the N95. I use it with the Opera Mobile (not Mini) browser which is quite good, I think. Not as good as an iPhone but good. Also the camera is really good. For everyday pics I don’t need a digital camera anymore. Reg. battery life: It’s always a good idea to turn off 3G mode when you don’t need it. I think it comes down to who you are. I mean, to me it’s really a right brain vs. left brain issue. If you try both and you’re still not sure, I’d go with the Nokia. As Louis Armstrong said when asked, “What is jazz?”, “If you gotta ask, you’ll never know.” If the iPhone is for you, you’ll know it. Get an iPhone, you won’t regret it! The software quirks will be ironed out shortly and the iPhone is really a paradigm shift for mobile phones (like the original Macs was for DOC PCs). iPhone!!! Main reason, it is a Pocket Unix-based Macintosh Computer with a camera, wireless internet, phone, and so on!!! Adding voice activation and recording is not that far off. Currently, you can go to iTunes App Store and get Recordifier ($4.99), SpeechCloud Voice Dialer (free) and a whole host of productivity applications. The iPhone. I’ve had about a dozen phones before the iPhone and they were all overly complicated pices of crap. The iPhone is so easy to use and straight-forward that I can’t see myself using anything other than an iPhone or something similar. But the software has to rock my socks. The bugs that it currently has will be shaken out…quickly. You don’t have to buy the data plan in order to use the iPhone. I’d recommend the iPhone if Sebhelyesfarku is indicative of the community you’ll be interacting with regarding the N95. Us Mactards may be gullible (if not fashionable in my case), but my experience is that we also tend to be pleasant and willing to help. If a better camera phone is more important to you, by all means got with the N95. I’d get a N95, simply because I have one and its a dream. I find it real easy to navigate the web on, but maybe thats just me. Wouldnt bother with the iPhone, a touch screen device that’ll soon be out of fashion. Knowing Apple it’ll be because Apple have some random device called the iSense phone, which controls a phone like device with your mind. Mind you, I’d wait a few weeks… The Nokia N96 is out soon, thats a phone and a half. Pay no attention to the Sebhelyesfarku-tards of the world. They wouldn’t know a superior product if it bit ’em on their tiny brains. Just because Apple made it (great) really bugs ’em. The whole issue is one of usability. Something Microsoft and others have NEVER figured out. Build it so normal people can easily use it and they will come. Apple’s done that with the iPhone. Nokia, based on Symbian, is like a Neanderthal compared to iPhone running OSX (unix) with App Store. iPhone is constantly improving, reinvinting itself, ever-growing. No comparison. iPhone is the future. Nokia is out-of-date technology. Nokia phones are the best phone investment that you could make. Year after year they have been providing quality phones for consumers. Unfortunately the new Nokia phones can cost you an arm and a leg, especially an unlocked Nokia N95. I found a great site to find unlocked Nokia cell phones from auctions. I bought 2 Nokia N95 cell phones for me and my wife, and we love them. Check them out at Unlocked Nokia Cell Phone Auctions. Just my 2 cents. Remember on most phones the camera is limited not by the mega-pixels but by the optics. The optics on both these cameras are quite bad (compared to your average garden variety digital point and shoot). Having had a N95 and jumping to an iPhone, I have not noticed any real difference of the quality of the pix. Both do poorly in low light situations. If all you are looking to do is to capture the moment, the iPhone will do just fine. Get the iPhone, you wont regret it. The screen’s the thing. It’s not just viewing web pages that benefits from the huge screen of the iPhone, but viewing PDFs, Word documents, Excel spreadsheets, running applications, using Web 2.0 Ajax-based web apps, viewing photos, viewing videos, etc etc. Running VNC on the iPhone to remotely control your PC or Mac is a joy on the iPhone and absolutely impossible on the Nokia for example. Screen-size is everything! You may be able to shot huge pixel-count photos and shoot video on the N95, but do you really want to try to view them on such a tiny screen that is half the physical size and half the resolution of the iPhone? The N95 is also twice as thick (bad for the pocket) and relies on a terrible toggle pad to navigate compared to point directly at something and click the touchscreen on the iPhone. Then there is the battery stand-by time of only 220hrs v 300hrs on the iPhone. It really is like comparing two totally different eras in mobile devices. Nice post. However, if you can wait, I would recommend you go for the N96 which is an upgrade to N95 slated to be out later this year. N96 is sleeker that N95 and will come with 16 GB memory, Mobile TV access, microSD card slot, improved Internet experience and sound, faster USB, WCDMA2100/900 (HSDPA) / EGSM900, GSM850/1800/1900 MHz (EGPRS) support, and automatic switching between bands and modes. I think it will satisfy you primary use case very well and give you something extra to keep you going. Thanks everyone. Great perspectives in the comments here. The upcoming N96 gives me some pause on my purchase plans. Does it have better web surfing? I’ll look into that. Still leaning toward the iPhone though. I’ve had a good experience with the iPod Touch. So that helps me understand what the iPhone experience will be like. The 3rd alternative is Windows Mobile, not as popular as Nokia, but currently more popular the the iPhone. Has the a strong developer community and like Nokia lots of apps available, like Skype etc. IE for WM6 is not a great browser, Opera 9.5 Mobile (currently in beta) is a good browser, almost iPhone Safari like in functionality. The N96 looks good, there are nice WM6 devices coming out of HTC and LG, but I am a sucker for the iPhone interface (iPod touch owner) so I probably replace my 18 month old HTC with an iPhone depending on what the carriers do in Au in the next few months. You obviously have more good points going for the iPhone than the N95. If you want a full blown camera, might as well get a camera. The phone functionality on the phone is so much better. Being an internet person, the bigger screen is definitely going to be a plus for you. I had a program crash my phone once. You know what I did? I just hit the power button and had the phone back in 30 seconds. No big deal. My old nokia has crashed before. And all it has is a phone function. No bluetooth even. Just like yours. Applications don’t crash quite that often. And most of the times, they don’t crash your whole phone. My phone has wifi, 3g and push email turned off. I’m getting about 2 days life on it. If I want to get online, edge is always there. If I want 3G, It’s a matter of 3 clicks, that’s all. And turning it off only takes 3 clicks as well. I just switched from an N95 to an iPhone (2G). While I certainly miss some of the features on the N95 (great video, live video using Qik, superb camera), I’m SO glad I switched. The photo and video tools are mostly toys — e-mail and web are what I need the most. When it comes to those, the difference is insanely better on the iPhone. It’s funny how these two phones are being compared when they are actually in different classes. Nokia makes 2 different smartphones, E series and N series. E series emphasizes connectivity and productivity, while N series is focused on multimedia. So if you’re looking for multimedia, definitely go with the N95 (or wait for the N96). Otherwise, compare the iPhone against a Nokia E series phone if web browsing and email are important. Either way, however, I think the iPhone will have the edge as a music device. Get a 3G iPhone, you won’t regret it! 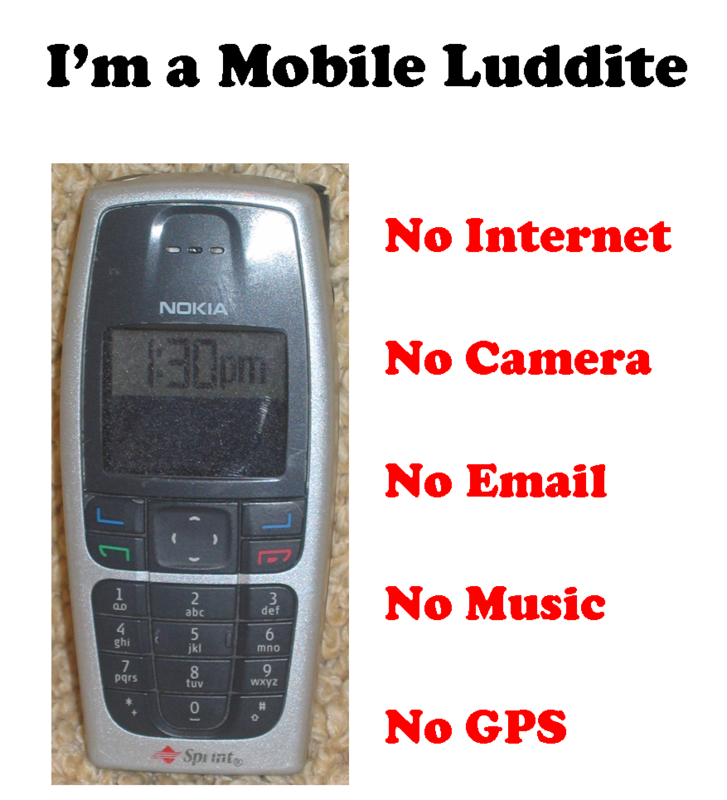 Random question seven years after you wrote this…Do you remember the name of your Sprint Nokia “luddite” phone (the one you have pictured on the carpet)? I had the exact same one circa 2007 and I would like to be able to remember the name of it. No, I do not recall the name of that model. Funny you found that old blog post, it brings back memories. My, how far we’ve come.